Switzerland is landlocked country knowns for its agricultural produce. Potatoes and cheese are important ingredients, and the cuisine of Switzerland is influenced by that of its neighbours namely French cuisine, German cuisine, and Italian cuisine. Each of the four linguistic regions of Switzerland (French, German, Italian, and Romansh) also have their own particular dishes, although most dishes can be found throughout the country. Älplermagronen - Macaroni with potatoes, onions, bacon and melted cheese. It is traditionally eaten with apple sauce. Chur meat pie - A meat pie from the Graub¨nden canton. 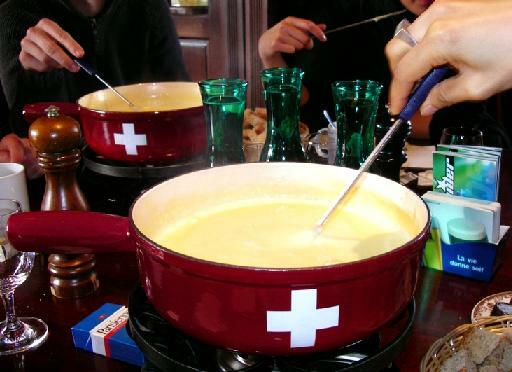 Fondue - Melted cheese in a pot. It is eaten by dipping small pieces of bread or potatoes into the melted cheese. Papet vaudois - A hotpot made from pork sausages with leeks and potatoes. Polenta - A kind of porridge made from ground yellow or white cornmeal (maize). Raclette - Melted cheese dribbed over potatoes. Raclette is used served with gherkins or pickled onions. Rösti - The Swiss version of hash browns.